glutinous rice "food made of rice"
Nuomici is a type of Chinese pastry. It is one of the most standard pastries in Hong Kong. It can also be found in most Chinatown bakery shops overseas. It is also referred to as glutinous rice dumpling. 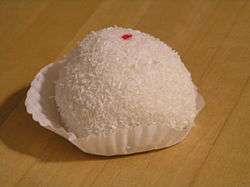 The glutinous rice ball can be dusted with dried coconut on the outside. The outer layer is made of a rice flour dough and the inside is typically filled with a sweet filling. The most common fillings are sugar with coconut and crumbled peanuts, red bean paste, and black sesame seed paste. ↑ Freely Chan (2007-03-19). "Glutinous Rice Ball With Red Bean Paste". homepages.ucl.ac.uk. Retrieved 12 August 2012. ↑ Sunflower (3 February 2010). "Lo Mai Chee with red bean paste 豆沙糯米糍". Retrieved 15 August 2012.